Banking on the individual requirement of the clients, we deliver well-managed range of Cable Tray Erection Service that are quality tested and maintains set quality guidelines. Owing to its exceptional attributes, they are widely used in light and heavy duty industries for erecting cable trays in organized way. Structural steel and electrical cable tray installation at various heights. Ease of Erection : Each Cable Trays are machine punched to precision & equally precise coupler. We Want Local Area Inquiries Only. Captivating the skills of our professionals, we are involved in rendering Cable Tray Erection Service. 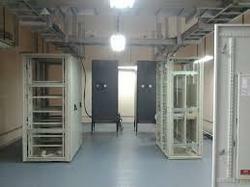 Our clients can avail from us Cable Tray Erection Services. We offer these services to suit the varied requirements of our clients. These services are offered to the clients as per the international requirements and specification. The set of our services is rendered by a team of diligent professionals. We offer high strength ladder type cable trays that are perfect for heavy-duty power distribution in industries. - Proper Earthing of Panel, Switchyard equipment etc. - All job is carried out with expertize and skilled man power. - Price per unit unit will be highly competitive. - Earthing value will be less than 1 Ohm. a. Top Loading of rigid jars, cans, cartons, bottles into dispenser display trays. b. Tray Loading – top or side loading of flexible pouches, blister packs, tooth brushes, confectionery sticks, biscuits, chewing gum boxes, yogurt cups, tea packs, etc. into display dispenser cartons. c. Wrap around tray erection around rigid products or collated matrix. Cable trays are erected for the purpose of carrying and supporting electrical cables between a power source and an article or item of electrical equipment. Industrial Projects • Consulting & Design of projects after the complete study of client requirement & addition Or alteration for better work process. • Supply, Installation of DG set with necessary liasoning with different government authorities.